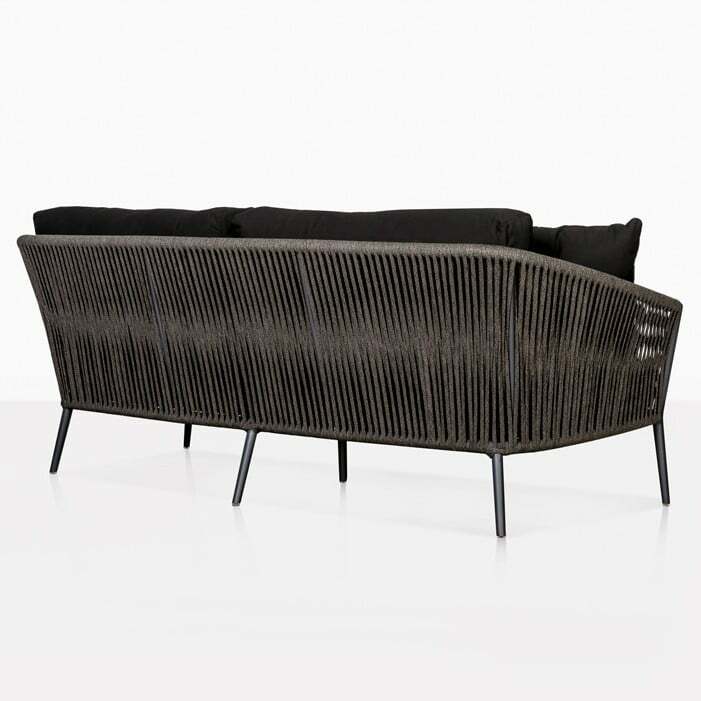 Weaving you into dreamy comfort, our Washington Rope Outdoor Sofa will impress your friends and keep you in chic opulence all year round with its slick design and long lasting materials. Making the most of your outdoors is important to us, which is why we’ve designed a piece that will complement many areas from the garden to the verandah! 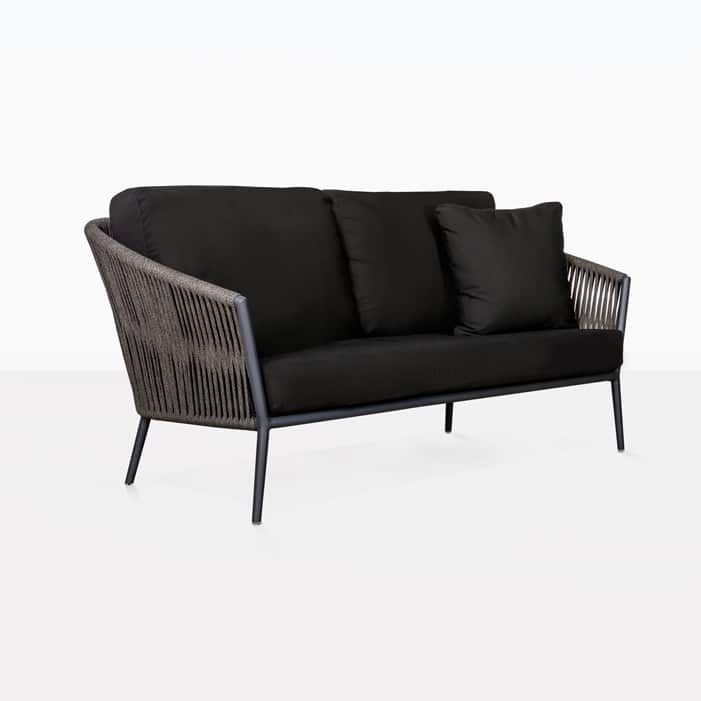 Our Washington 3 Seater Outdoor Sofa is exceptionally comfortable with deep seating, curved arms, plump cushions and seemingly delicate rope tastefully woven around an aluminum frame. This is the piece of furniture that you’ll dive into with a book and a cuppa and stay there for the rest of the day! All Sunbrella® cushions are free as shown with purchase; all throw pillows are sold separately. 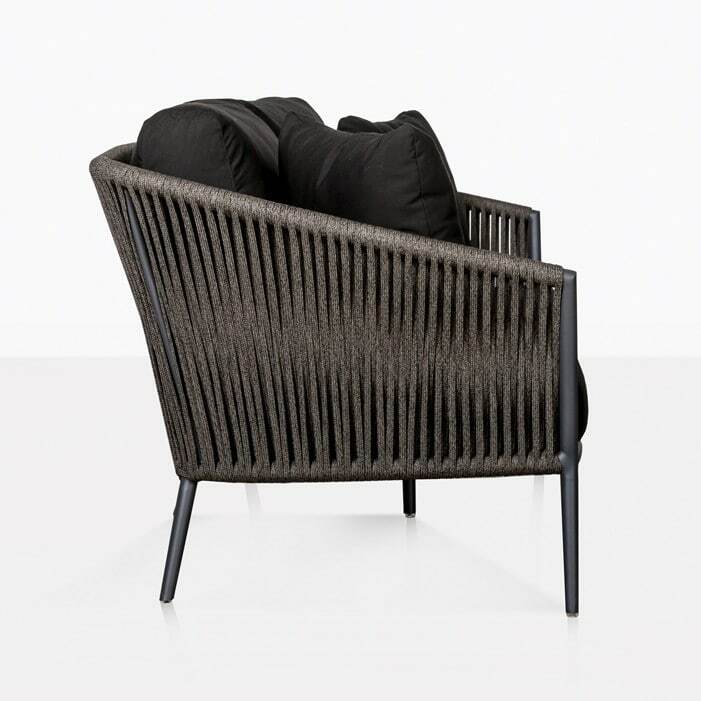 The Washington Rope Outdoor Furniture Collection from Design Warehouse is an exquisite blend of vintage styling and modern sensibilities. 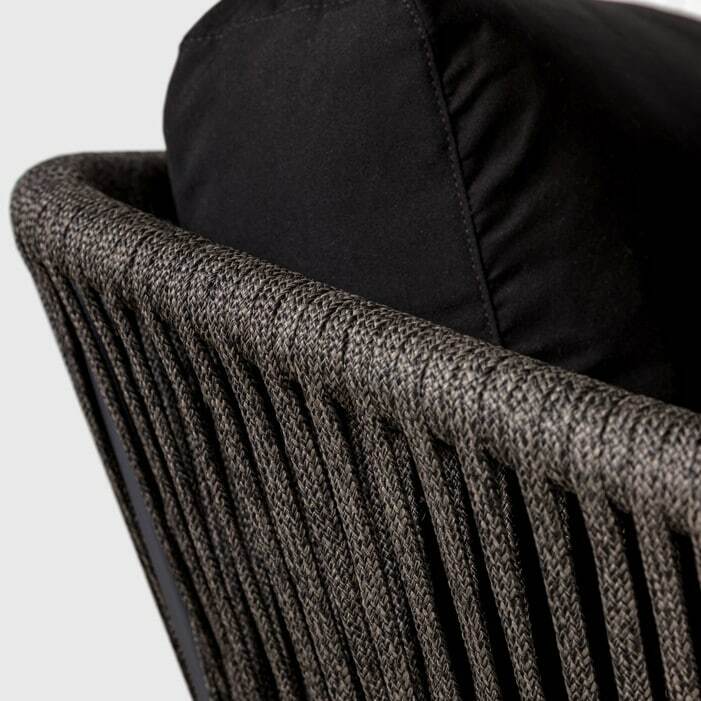 Plush cushions rest on a bed of soft woven rope, wrapped expertly on a sturdy powder coated aluminum frame. 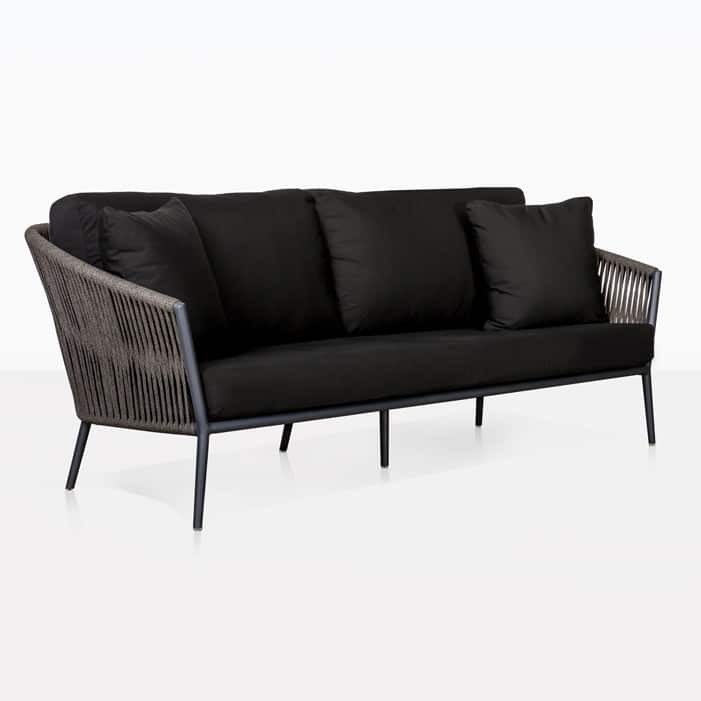 Our Washington 3 Seater Rope Sofa is equipped with luxuriously woven all weather Italian rope, powder coated charcoal aluminum and cushioned with ever-popular Sunbrella® cushions, filled with QuickDry® foam. When you asked for quality, we delivered with the Washington Collection! These materials are durable, good looking and therefore you can truly relax and enjoy the finer things in life! Win, win! Inspired by dramatic architecture, you’ll find each piece in the illustrious Washington Outdoor Collection is eye catching, stylish, comfortable and will suit a number of settings – from the garden to the patio and beyond! Pair up this sophisticated Washington outdoor couch with two Club Chairs and a coffee table perhaps in a matching powder coated style, for a stylish and polished verandah setting – an immediate, glamorous setting unique to your space and taste! If you are seeking cohesion in your garden but don’t want to miss out on a mix of dining and relaxation furniture, then start with your Washington Outdoor Sofa, framed by a Washington Loveseat and two Club Chairs with a beautiful teak coffee table or side table for beverages – the perfect blend to complement your solid teak table and comfortable Washington Dining Chairs dotted around the outside. Your look will be unique, luxurious and a satisfying escape from the perils of everyday life. You wont beat the comfort of the Washington 3 Seater couch, complete with free Sunbrella® cushions. 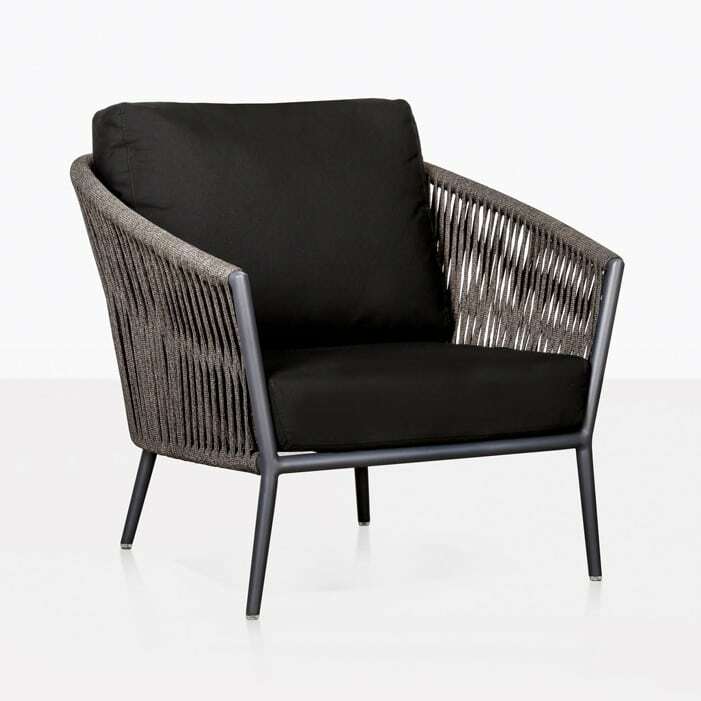 You won’t find a better way to spend your days, whether curled up or engaged in chat with friends, the Washington Rope Outdoor Sofa is the core piece to a dynamic, fabulous collection. Purchase now, it’s that easy! And in no time at all you’ll be in bliss on this luxurious piece of quality outdoor furniture.